It’s cold and covered in snow outside, so let’s talk about something green. 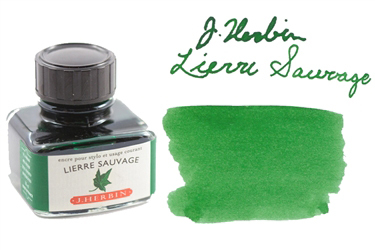 How about J. Herbin Lierre Sauvage fountain pen ink, which means “Wild Ivy” in French. 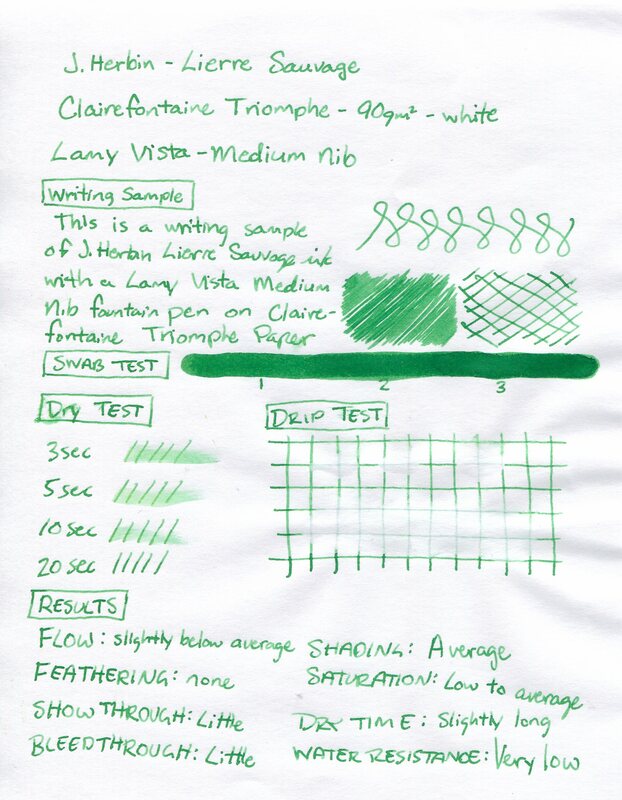 I’m usually not a big fan of green inks as I can’t seem to find a regular use for them, but this is a pretty fun ink that I enjoyed checking out for this review. 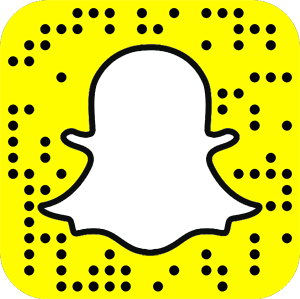 See all of the details below. While I didn’t experience any starting or skipping issues, the ink didn’t write as wet as I normally enjoy my ink. On ultra close inspection of some of the swabbed areas, there was some bleed through, but as you can tell in the image, it’s barely, if at all, noticeable. Don’t get this ink wet if you want to keep seeing your work. There’s very little water resistance here with just the faintest lines remaining after the drip and smear tests. After experiencing the flow of the ink, I really expected the dry time to be fairly quick; however, it actually took longer than average to dry at about 10s – 20s on all papers tested. I didn’t experience any feathering with any of the papers used. There was some decent shading with think that helped to keep things interesting. While it’s not the most vibrant green ink out there, it’s still a pretty saturated ink that’ll produce a great color. The low-water resistant ink was super easy to clean out. There wasn’t any staining or stubborn ink – just a few flushes with water and I was good to go for my next fill-up! Overall, I enjoyed this ink despite not being a regular fan of green inks. I just can’t seem to decide on what they should be used for – regular writing (I usually prefer black or blue-black,) emphasizing or underlining words (I usually prefer a bright blue, orange or red,) or editing (I’m red all the way here.) Green always seems to be the color I grab when my usual colors aren’t around or I want a new color to change things up a bit. Nevertheless, this was still an interesting ink that I’ll likely use again when I’m tired of my usual colors. It has a decent flow, good shading, performs well on just about any paper, and is ultra easy to clean. 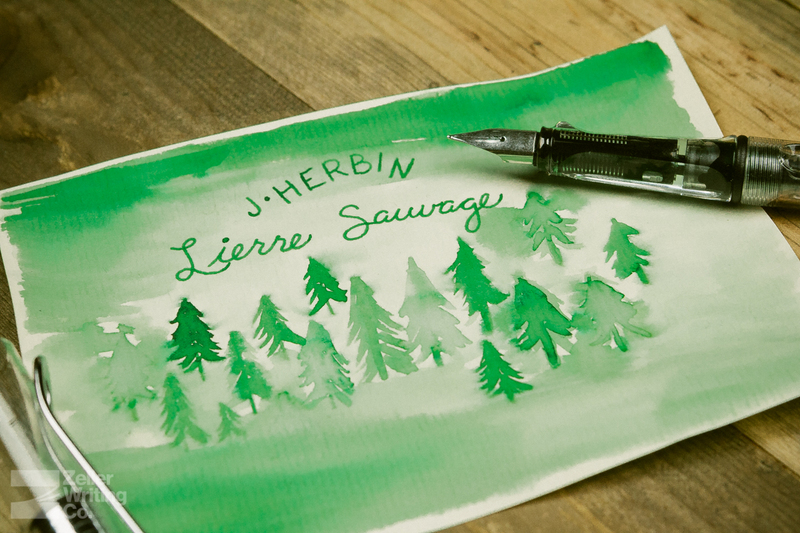 If you’re in the market for a great green ink, or just want a new color to spice things up, then J. Herbin Lierre Sauvage is worth checking out. At about $11 for a 30mL bottle, it’s about average in price, but very high in quality with the J. Herbin name – one of the oldest brands in the world. Have you ever experienced poison ivy? Let us know in the comments below!